The first is based off a sketch I drew. The wizard head always reminded me of the magic mirror from Disney's Snow White, and since Oz is the all-powerful emperor, I thought of a Mandarin from Imperial China. I had to include your classic bulbous-headed 1939 Wizard, of course; next, what gallery of terrifying inscrutible faces would be complete without an Easter Island Maoi statue? 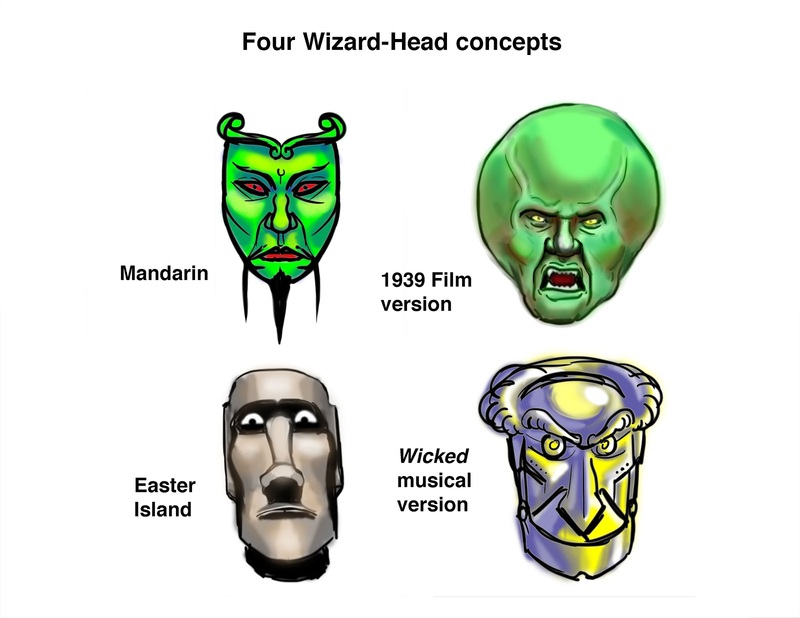 The last one intrigued me most of all: the Wizard puppet from the musical, Wicked. It was originally designed as a cross between Frank L. Baum's Wonderful Wizard of Oz book illustration of the head and the 1939 Tin Man. While the production head itself is a fairly complex bit of engineering, I've seen clips of amateur productions that feature a blacksuited cast member and a giant cardboard mask with movable lower jaw - simple, yet very effective (especially with red LED eyes). I'll keep you posted on further developments. Everybody's shutting down their blogs but me!